I have a dilettante's interest in calligraphy but was often put off by the tedium of ruling my practice sheets. Being a programmer by trade, I wrote a little script that generated PDFs for this. Someone on the excellent cyberscribes mailing list asked for such a tool so I wrapped it up as a web application and put it online here. Following is a description of each field. This is the width of your nib in millimeters. All other measurements (unless specified otherwise) are in multiples of this. A Speedball C3 nib which I most commonly use for practice is approximately 2mm wide. For that, you'd enter 2 here. 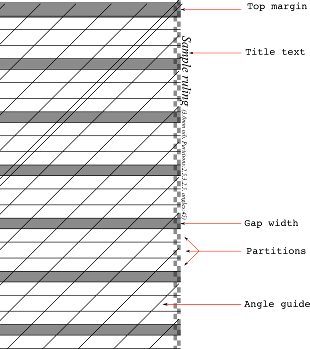 This is a list of partitions which each line should have. For a hand like the Foundational, the x-height is 4 nib widths, the ascenders go upto 3 nibs about the waist line and the descenders drop to 3 nib widths below the base line. This means that you would enter 3,4,3 in the partitions box and you'd get rulings giving you your cap line, waist line, base line and drop line. It will automatically adjust this based on your nib width. Fractions are allowed here so you can say things like 2.5,3,4.5 and it will work. You can put as many partitions are you want separated by commas. This is the gap between successive lines. It will be greyed out so will appear as a thick bar. These many nib widths will be skipped and greyed out at the top. The number of lines of text you want the ruling sheet to be generated for. You can specify a comma separated list of numbers here and the sheet will have lines drawn at these angles. Useful for people like me who need a guide to hold their nibs properly. It's also useful for some scripts like the Italic hand where the text needs a slight inclination. You can type something here and it will appear in bold on the right of your sheet. I usually put the nib names here so that I can pick things out easily. This allows you set the page sizes. The default is A4. A3 is the other available option. If you select this, the program will generate a concentric circles with the above specifications rather than parallel lines. This is useful to write circular text. This is a work in progress so feedback is welcome. The script will also draw a nib ladder on either side of the paper for you to double check. The diagram below indicates what the various fields control. The following is a partial list of sheets which people have generated over the past few months. You can click on them to get a similar sheet for yourself. Code for this website is available at https://github.com/nibrahim/Calligraphic-Rulings. Styling for the form above taken from html5rocks.